While Singapore has plenty of accommodation options for its size, finding a chic boutique hotel that is both centrally located and moderately priced, is not an easy task. On my recent trip to the island nation, I stayed in two boutique hotels, and I hope my reviews will make your own search and decision-making easier! Located in a quaint shop house on the quirky Keok Siak Street in Chinatown, Naumi Liora is a charming boutique hotel with tastefully done interiors. It retains the shop house heritage of the area with its tiny windows and bright orange exterior. Unlike any boutique hotel I’ve stayed at so far, the lobby of the hotel offers a 24-hour Nibbles Snackbar, with complimentary tea, coffee, ice cream, cookies, chips and other bite-sized snacks! Shophouse-turned-chic boutique hotel, Naumi Liora. The Rooms: Though box-sized (like most small hotels in Singapore), I found the rooms to be very cozy, tastefully decorated, and creatively optimized for space. The bathroom, though small, comes with high quality fittings. 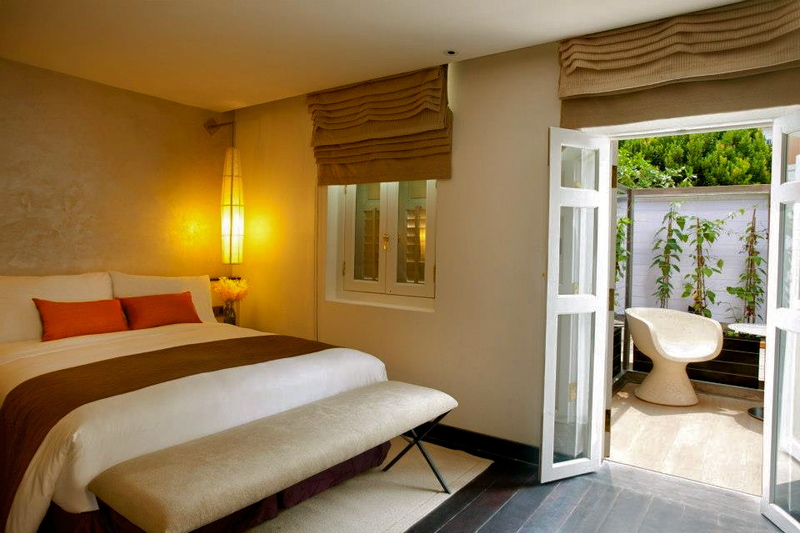 The higher category rooms come with their own French-style courtyard, and are certainly worth an upgrade. The Heritage Single room at Naumi Liora. The Location: Keok Siak and its neighboring streets are upcoming areas in Singapore, and have recently seen a surge of concept bars and cafes, including a password-protected bar a short walk from the hotel. The Outram Park MRT station is a five-minute walk, and connects to both City Hall (on the green line) and Harbour Front (on the purple line). Orchard Road and Clarke Quay are a ten and five-minute cab rides away respectively, and overall, the location is great amid the quaint streets of Chinatown. The Service: I found the service to be exceptionally friendly for Singapore standards; the staff at the reception was warm and welcoming, not only while I was staying at the hotel, but even when I came to collect my luggage a week later (after my Thailand trip). Five stars for that! The room with courtyard / porch at Naumi Liora. Breakfast and Wifi: Complimentary breakfast is provided at a café next door, with charming wooden interiors and an open kitchen. The breakfast spread is small, but the breads are freshly baked and the eggs are prepared hot. Complimentary Wifi is provided throughout the hotel and the speed is excellent. Price and Booking: A double or twin room in the heritage category starts at US$ 140, inclusive of breakfast. AsiaRooms offers good deals for the hotel, and is a credible resource for hotel bookings. Overall: Despite my initial hesitation to stay in Chinatown, I loved Naumi Liora boutique hotel – it’s quaint and charming, with great staff and cozy rooms, and not to forget, the complimentary snackbar! The location is convenient, the wifi is free and fast, and the breakfast is decent. Highly recommended. The Nibbles Snackbar, 24 hours and complimentary, at Naumi Liora. A boutique hotel under $150 in the vicinity of one of Singapore’s most popular shopping areas is a steal in itself! Central to Bugis, Dhobi Ghaut, Orchard and Little India, the location is easily the biggest draw of Parc Sovereign. Complementing that are modern interiors and a rooftop swimming pool. The rooftop swimming pool at Parc Sovereign. The Rooms: The rooms are tiny, but clean and well maintained, with all basic necessities; comfortable beds, a writing desk, large windows, and a modern bathroom. Double-bedded rooms are small in number as compared to twin rooms, so it’s best to call ahead and secure one. The Location: As someone who loves to walk, I found the location to be extremely convenient. Not just the metro, but Bugis Junction mall, the street markets of Bugis, the cultural precinct of Little India, the electronics supermarket of Sim Lim, and Orchard Road are all walkable within 10-20 minutes. The Service: The service is nothing to write home about; the staff at the reception won’t go out of their way for you, but won’t disappoint either. The footfall of the hotel, given its location, might explain that. Executive twin room at Parc Sovereign. Breakfast and Wifi: Breakfast is not complimentary, but within walking distance are two local coffee shops, and further down at the Bugis Junction mall are Mc Donalds, Starbucks and Bread Talk. What’s a real bummer is that Wifi is not free of charge, although it costs only SGD5 for 24 hours! Makes you wonder why they won’t just include it in the cost of the room. It’s not too fast either, which makes you feel like you’re paying for slow Wifi (unacceptable to a digital nomad like myself, though it might not be a deal breaker for many). Price and Bookings: Prices start at US$100 for a double or twin room, and again, you can find discounted rates on AsiaRooms, which aggregates accommodation options across Southeast Asia. Overall: I would recommend Parc Sovereign hotel in Singapore if great location on a budget is your first priority. The rooms are nice, but the service is average, the Wifi is slow, and breakfast is not complimentary. Conveniently located near the city center of Singapore. My stays at Naumi Liora and Parc Sovereign were sponsored by the Singapore Tourism Board and Asia Rooms, but opinions, as always, are my own. Have you been to Singapore? What boutique / budget hotels would you recommend? Join me on Facebook or Twitter for more practical travel tips and reviews from my travels. NOTE: I originally published this blog post on Monday, 25th March, but it disappeared somewhere in the black hole of WordPress! Apologies for that. And apologies if your comments have gone missing along with that too. Very helpful post, Shivya. Harbourfront is on the purple line, not the red line. Thanks, and my bad. Edited that! I stayed in Hotel 1929 when I was there in 2011 and loved it. The room was small but very well designed and comfortable. It has a strong architectural bent. Very interesting list, thank you for sharing! Glad you found it interesting! Any boutique hotels to add? I’ve been surfing on-line more than three hours today, but I never discovered any interesting article like yours. It is beautiful worth sufficient for me. In my opinion, if all site owners and bloggers made excellent content as you did, the internet will likely be much more helpful than ever before. I’m going to take a note of your site and keep checking for new details about once per week. I subscribed to your RSS feed as well. Hey Shivya, Love your blog and thoroughly enjoy reading them. I stayed at the Moon Hotel in Little India Singapore last year and truly enjoyed our stay with them. The rooms are compact but very cozy. They surely house the best beds and pillows and the stay was true value for money with free access to the (well stocked) mini bar, free Singapore slings and high tea every evening. Not to forget the super fast Wifi and the personalised Welcome TV screen complete with basic travel information. Shivya, we just booked a room for 3 nts at the Naumi Liora based on your reco 🙂 Though since we are travelling in peak season (Xmas), room rates are double of what you quoted 🙁 But that’s the case among all hotels in Sing – hopefully Naumi Liora lives upto our high expectations. Keep the reviews coming! or copyright infringement? My website has a lot off unique content I’ve either authored myself or outsourced but it looks like a lot of it is popping it uup all over the internet without my permission. Do you now any methods to help protect against content from being ripped off? Next Post4 Time Zones, 2 Bucket List Items, 1 Month.